It was an all-around pleasant weekend. Friday night I picked up the kids and Joanna made a delicious meal of corn, potato salad, and burgers. Saturday was pretty low-key, playing with kids and doing fairly routine things. One highlight was hanging up my new hammock chair, which Emma immediately adopted as her reading nook. That evening Jamie picked up the kids to go to Dave's for a BBQ. Joanna and I walked down to the County Fair where she was performing with some friends on the community stage. We managed to visit the farm animals before her gig started and were quite impressed with the agricultural oddities. I returned to get kids to bed while Joanna stuck around to play bingo, watch pig races, and talk with friends. The evening wrapped up with some Orphan Black for Joanna, Sam, and I. Today was a little more exciting. Emma and I had french toast, Sam had a bacon and egg sandwich, and Joanna went off to church and singing. I took the kids to Hendrick's park where we walked around and talked about anime. We eventually ended up at Humble Bagel, eating pain au chocolate and cafe au lait in honor of Paris. Afterward we went to Evolution Gaming, where Sam worked furiously at some crazy logic puzzle and I picked up a card game called Dungeoneering. We played upon our return home, which ended up being new and different and pretty fun, especially because I won. 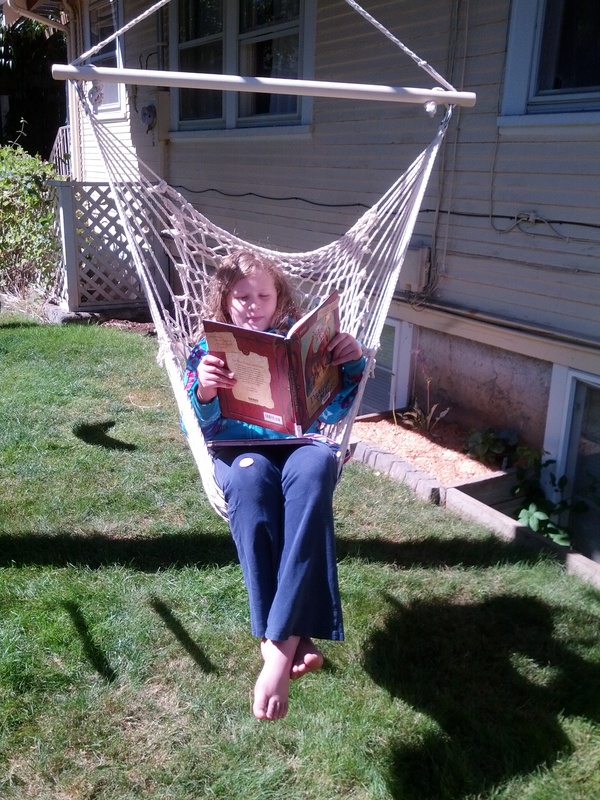 Sam mowed the yard, as is usual, Emma read, and I watered. Somehow it devolved into a hose spraying game, with Sam joining in on the fun. Eventually we dried off, went inside, then ate a delicious meal of ribs and corn bread muffins that Joanna had prepared. We're wrapping up the day. Tomorrow Joanna and I are heading to Portland for a belated anniversary trip. I have a work thing in Vancouver after that, but fortunately we won't be gone too long. I am blessed by many things -- including having three lovely mothers-in-law. I went out today for a long, leisurely lunch with two of them: Sue and Yayoe (listed in chronological order of marriage to Lohring). This must be what it's like to be retired! It was enjoyable to have lots of adult conversation about intelligent things and to talk about life and family. Then I did useful things like get the oil and transmission fluid changed in the minivan. 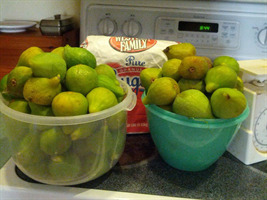 In other news, I successfully made jam with 6 lbs of figs (I counted how many ounces of jam that made, but now I've forgotten) and Adam came home with 8 lbs of plums from a coworker. Now you know what you're getting for Christmas. Life after PeaceHealth is quite pleasant so far. I have long lists of things to do -- personally, for the house and garden, and to start a consulting business. My goal is to do at least one thing from each list every day, along with exercise and get 10,000 steps over the course of the day. So far, I've been completely successful. I figure as a self-motivated, highly-productive person I'll be fine getting things done and not falling into a vat of apathy. Tonight is pizza and "science-show-of-the-week" night, with a hopefully delicious quiche for me and Adam. Being at home also allows my culinary skills to flourish as I have more than 30 minutes to make meals. I'm still at home, finished with my usual morning chores while everyone still sleeps. Whichever parent passed along the "doesn't need much sleep" gene, it certainly comes in handy. 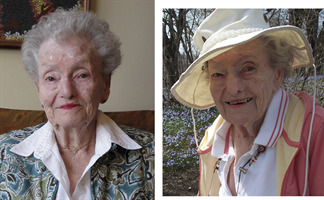 I've been somber the last few days, thinking about Dorothy, the time I spent with her, and mortality in general. Time keeps zipping along the older I get. She will be missed. Most of the week was without children, with Joanna and I doing assorted events throughout the week. Monday night we learned West Coast Swing, Tuesday she had rehearsal and I Skyped with Sam, Wednesday we went shopping at the Oakway Center and listened to a steel drum band. Joanna's also been great with assorted house projects. 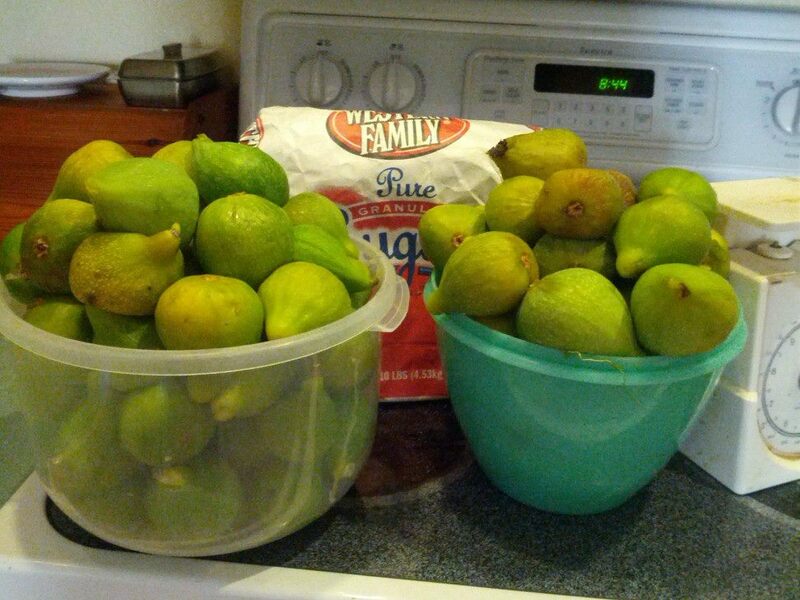 She made fig jam, started cleaning out the garage, and has done a tremendous amount of laundry. We've also got a trip to Portland/Vancouver coming together next week where she's potentially drumming up some consulting work. It was nice seeing Sam and Emma last night. We chatted and laughed and I watched them do their assorted things. Hopefully we can have some good hangout time this weekend too. 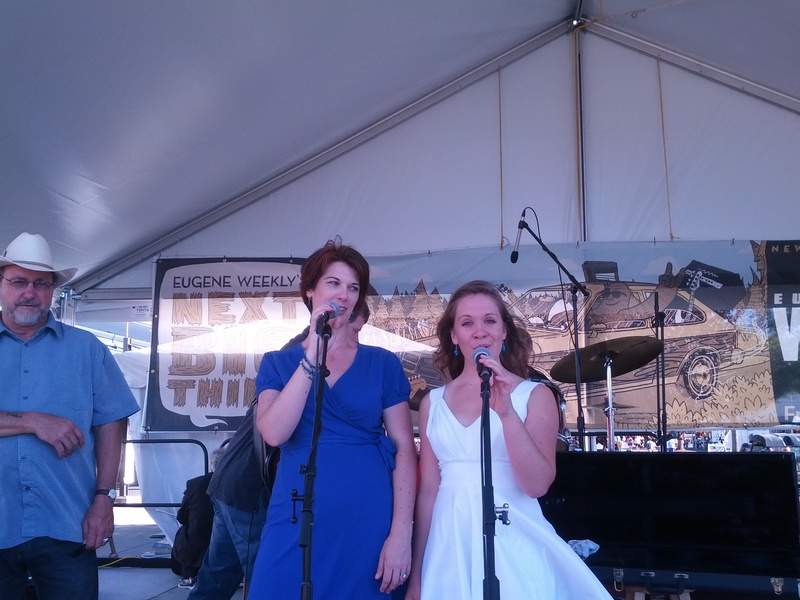 Joanna's performing at the Lane County Fair, and I think I'll manage to see her. Okay, time to shower and get a few minutes closer to that delicious mocha. My mother died today at about 1:00 Pacific Time. Danica reports that her passing was peaceful. Friday night we had my mom and Bob over for a quick birthday dinner, along with Joanna showering me with gifts and a cake to boot. The weekend was generally relaxing, with lots of time hanging out with Sam and Emma. 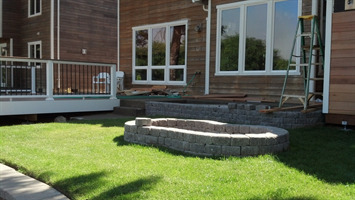 Joanna and I managed a few significant house projects, weeding, putting up a hose holder, and replacing the dryer vent. The latter was a little much, and I declared myself done with work Sunday afternoon and played Magicka endlessly with Sam to our mutual amusement. Emma finally got to hang out with Kate, whom she's been missing greatly. Monday morning I worked from home until Emma arrived while Jamie went to work. Joanna took her to the library and St. Vincent De Pauls, slowly cleaning out our garage. Sam mowed the lawn, somewhat reluctantly. I was swamped with work all day, coming to the realization that I couldn't do two weeks of work in two days. As the evening rolled around, Joanna and I went to my mom's for dinner. It was a little odd having no kids about, but we managed just fine. After we went to a west coast swing class and then open dance. I know maybe three moves, so I felt a little overwhelmed, but Joanna was cheerful and the music was good. I'm trying to get Joanna to go to the movies with me tonight or tomorrow while we're pretending to have no children. Perhaps there is some other mischief we can get up to. We're here safe and sound! Sadie and Greg were wonderful hosts and allowed for the perfect re acclamation point. Robbie picked us up in Albuquerque last night and we stayed over before heading back to the house this morning. The very nice barista gave me my mocha for free this morning, making it extra tasty. I just finished the last sip, much needed for my jetlagged brain. Emma and I made it across much of the world, three days of trains and planes. It was pretty exhausting, though it generally went okay. There was the brief crisis in Washington when we had to go to the other airport (Reagan, not Dulles), and later when the hotel shuttle didn't operate early enough for us to get to our flight. Fortunately mom's magic credit card fixed both those issues and we finally made it home Wednesday afternoon. I dropped Emma off at her mom's, who she missed very much. I went home, said hello to Josh and Sam, took a quick shower, and picked up Joanna. I think Sam and Josh spent a lot of time together, which is kinda cool. Sam said he spent half the nights at my house. They didn't quite run out of the frozen meals Joanna stocked the freezer with, but it was close. I went to bed early, waking up the next day at a semi reasonable hour. I worked from home Thursday, getting through over a thousand emails. I spent my lunch hour fixing the sewage injection pump, which was exactly as much fun as it sounds. Fortunately I understood the weird plumbing well enough to think it through and it ended up being a cleaning job. I was so incredibly wacky last night from jetlag, getting to sleep around nine and waking up at three. I've had a headache off and on for a few days, so I took more painkillers, ate cereal, and went back to sleep until six. At the moment, I feel pretty good. I'll collect the kids from their mom's when I get off work and have Tasty Thai for my birthday dinner. One of the two birthday cards I received was from my insurance agent, which was actually kinda funny. 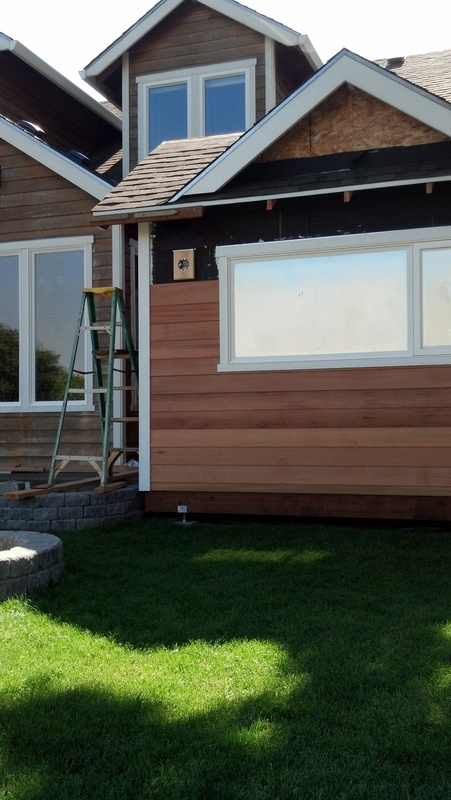 As some of you know, we have been working on the outside of our house. The deck has been finished for a while, but we are adding a small yard with a fire pit, flower beds, and a storage shed. 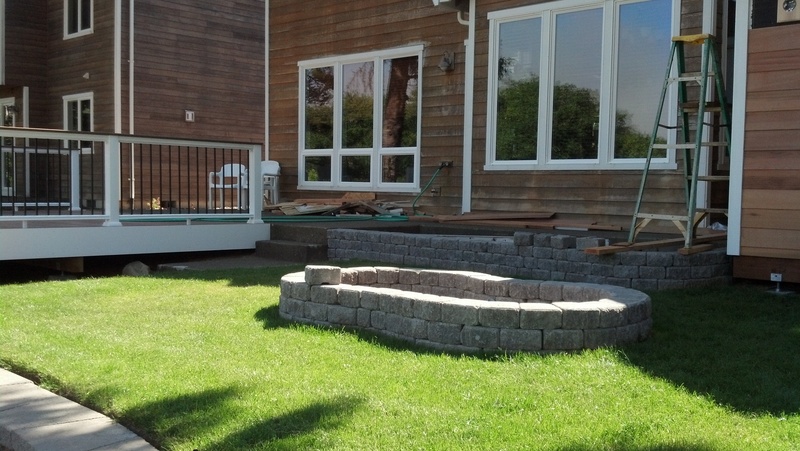 When we get finished we can sit around the fire pit and roast marshmallows or sit on the deck and watch the sunset. 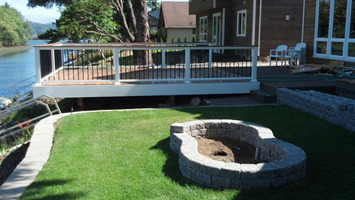 Next will be a floating dock for the boat and some landscaping on the road side. It's Bastille Day here in France, with everything closed. Tomorrow we begin our long trip back home, three days of travel across nine time zones. We've had three relaxing days here in Besle, with very little to do except eat, play, and chat. Emma has watched so much Teen Titans that she's able to think in the voices of the characters. Duncan has been playing non-stop with Arthur, occasionally including Berry in their boyish ways. Berry set up a little shop in the old, roofless house, selling shells and rocks that she found around the yard. We all went out for a little walk in the countryside, finding frogs near the ponds. Dinners are late, and we all sleep in. It's such a contrast from my usual running about. 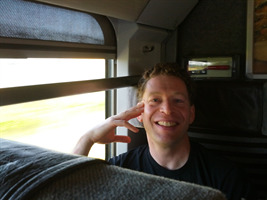 Tomorrow we start at 8:30, take a couple trains for 6 or 7 hours until we reach London. Then we collapse, wake up early to get to the airport, and Emma and I make our way to Chicago. A brief sleep later and we make our way to Portland, then drive home. Somewhere in there Joanna takes Berry and Duncan to their dad's house and arrives in Eugene later that night. The next day it's back to work for me, along with probably a million emails. I'm sitting here on Bastille Day on the bed in our room. I'm so tired I intend to spend the day googling pictures of the things we haven't seen yet, as opposed to actually going to see them. 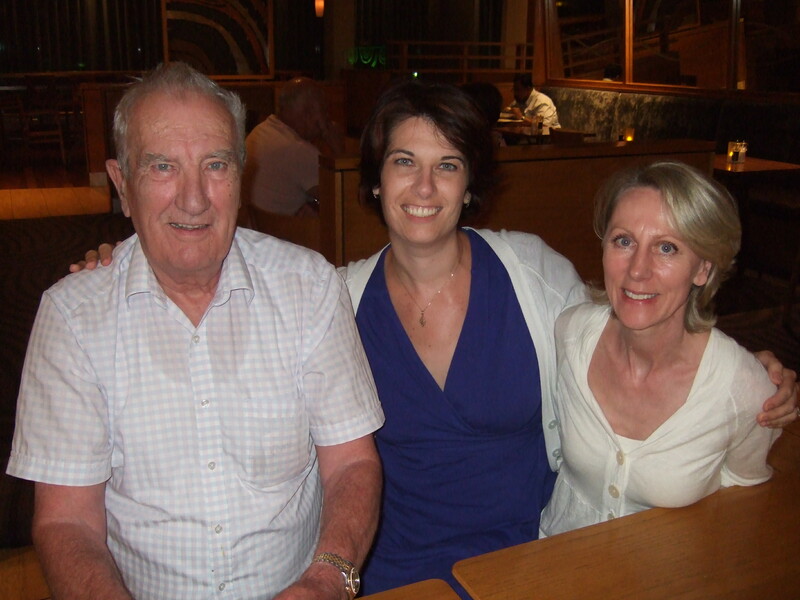 We had a lovely lunch with the Albertellis, the family who adopted Anna while she was in France. 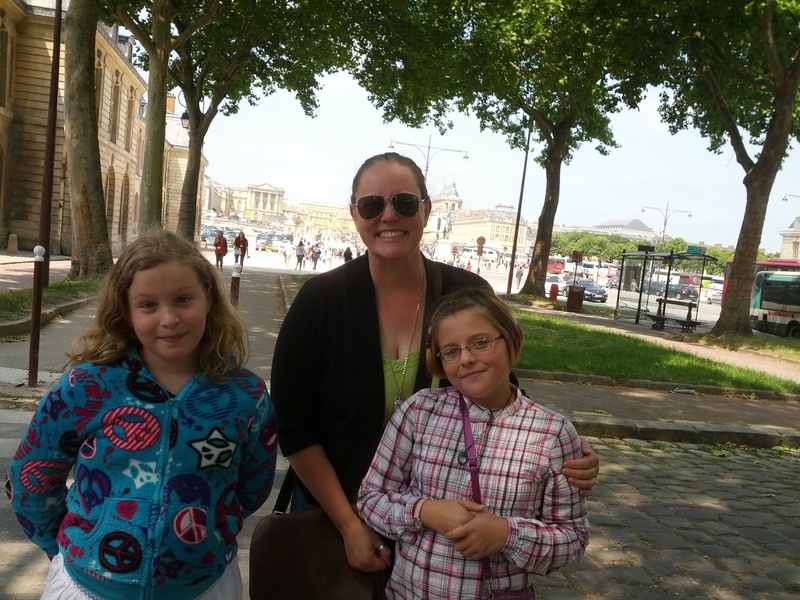 They thought Isa should come to France for college and stay with them.Marie-Eve, the mom, was injured in a bad car accident, and is still recurperating. We also went up to Mont Marte? and rode on the 19th century merry-go-round yesterday. Seraph and Isa took me to a restaurant across from an old old church in the Latin Quarter on Friday evening. I had beef, not something I eat alot. It was in a light cream sauce, and definitely worth coming to Paris for. But on the non-funky side, all 10 or twelve first floor rooms open onto a hugh courtyard, so the place is like a compound in a Mediterranean or mid-east country. I have my underwear draped over the chairs drying, while we have breakfast at the table outside our room. Now, I better double check transportation arrangements. Adam, I have to forward you a meal voucher to print off on Christopher's computer. Hug baby Finn and Arthur for us. Love to all. Yesterday was somewhat exciting, taking two sets of trains to get to Besle (pronounced Bele). Fortunately Joanna had taken the trip a couple days earlier, and so she warned us of the abandoned train station at the end of our journey. Emma and I unloaded into a desolate little area just as Christopher and Joanna arrived. It's been wonderful to see Christopher and his son Arthur again, and meeting Imi and the new baby Finn has been great. We seem to be on French time, with everyone staying up, eating, and chatting. We had a few interesting guests last night - Christopher's old girlfriend, her husband, and their new daughter. We had a massive meal with four or five kinds of meat cooked for everyone. Berry and Emma enjoyed puttering around the farm and the old out buildings. Berry set up a shop where she can sell the things she finds. I've been trying to help with dishes and such, play with kids, and take it easy. 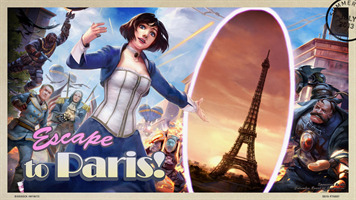 I continue to borrow Christopher's new laptop and just installed Steam so I can play a couple of the new games I bought. Joanna may be heading out to a bakery this morning, if she can find the way. We've become accustomed to pain au chocolate. It's the start of the Steam Summer Sale and I'm thousands of miles away from my computer. Fortunately we just arrived at Christopher's house and he has a decent Internet connection and a newly purchased laptop that will work in a pinch. I'm not sure how much gaming I'll manage over the next few days, but it does seem to be a time for hanging out and doing very little. We had a rather exciting day yesterday. It started with Seraph fixing us a fine breakfast with plenty of pain au chocolate. My mom went to do other tasks that day, so she offered to finish my still-wet laundry. 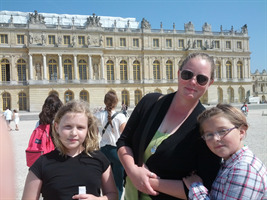 Seraph, Isa, Emma, and I made our way out to Versailles with minor difficulties. Upon our arrival we had lunch and settled into the long line to the castle. 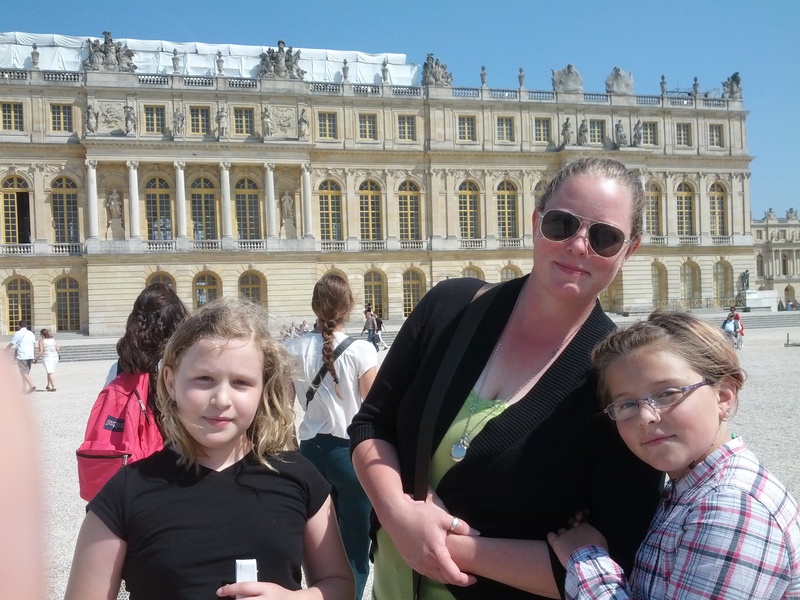 It was pretty crazy opulent, and we only managed to get through a small fraction of the grounds. By the time we got to the park section, the entire French Revolution started to make perfect sense. Everyone had been standing for a long while, but we fortunately found a little cafe tucked into the shrubbery. We plopped down, Emma fed me ice cream, Seraph got me coffee, and all was well. We wandered the grounds for a while, then headed back to the hotel. That was when the excitement began. My key didn't work, so I went to the front desk and tried to explain the problem in French. "That's normal," he replied, and showed how I was supposed to have checked out that day, pointing to everything they'd taken from my room and stuck in the lobby. Slowly it dawned on me that there'd been a miscommunication on dates and I hadn't checked closely enough. They made a quick call to a hotel down the road and told us there was room. After looking for my mother and not finding her, I checked out and hauled everything down the road. Fortunately all went well and we got a lovely room with relatively speedy WiFi. We fetched the girls and Seraph made a nice dinner, complete with birthday cake. Eventually she returned and found my mom, safe and sound. Emma and I had a great little video chat with Sam, who had to look up our direction on Google Maps so he could accurately blow kisses at us. We've now slept and are planning on heading up the hill to get my clean clothes before leaving on the train later this morning. Joanna, who's already there, promises relaxation in the countryside. 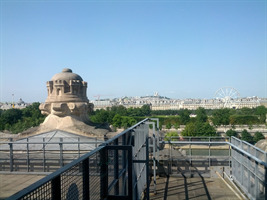 Paris has been lovely and exciting, though I must admit that a few days of doing little sound quite appealing. It's been so busy that I haven't had a chance to post. Emma is sleeping still and I figure I have a half hour to try to put together a movie before showers and breakfast and such. We've all been going to bed really late, in part due to the heat. I haven't touched the jeans I brought and wish I had a couple more pairs of shorts. Tuesday morning we all woke up with a general plan to get to the Eiffel Tower. 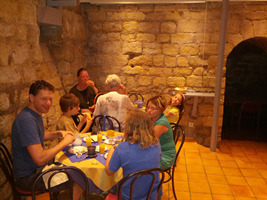 We went down to the wine cellar where they served us coffee and pastries, which was wonderful. Eventually we made it to the Metro and worked our way to the train station to pick up tickets for upcoming trips. While my mom did that, we tried to find our way to a gluten free bakery, but failed and returned. Once more we went down into the hot Metro. After some time we emerged, turned the corner, and found ourselves across the river from the monument, a horde of tourists taking pictures. We were all pretty beat at that point, so we crossed a busy street to a park in the middle of a roundabout and ate our picnic lunch. There were a bunch of African men selling Eiffel Tower models, along with souvenir shops by the plaza. The little kids all managed to get trinkets - earrings that Berry loved, and a pocket watch for Emma. The day was fading fast, and everyone was pretty beat. 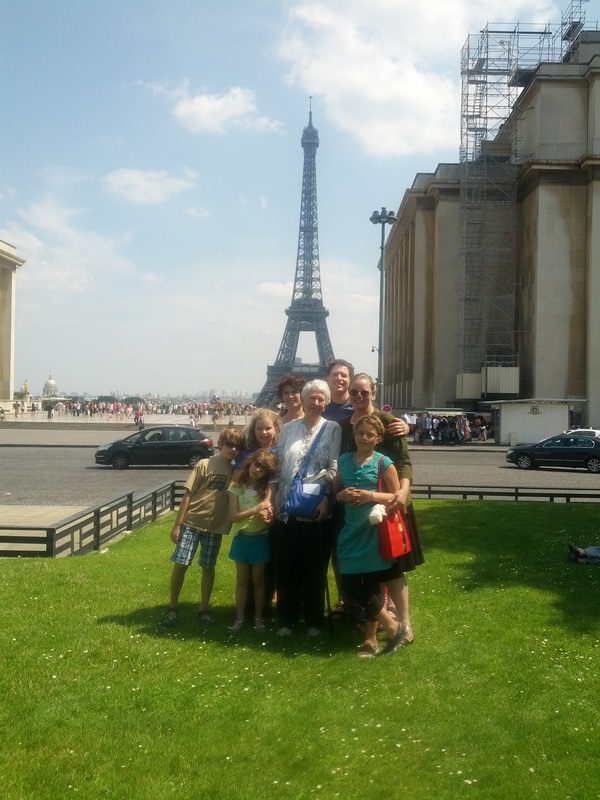 Mom called about boat tours of the Siene, and we once again braved the Metro to get to the Eiffel Tower and hop on a boat. I thought it was a pretty good journey. The little kids were exhausted and cranky, though. After seeing the 22 bridges and cheering on the people making out at the river bank, it was time to go home. Joanna whipped up another inspired dinner for all, and we got kids through their evening routine. We collapsed, exhausted but happy. Wednesday morning we woke up early and got Joanna packed for her train trip. We had time for coffee and pastries, and then I helped rush Joanna and the kids off to their train station. It was hard work, lugging the big cases up the stairs, but we managed and got them off in time. I was proud of myself for navigating the Metro without assistance. I think I've got the hang of the twisty underground tunnels at this point. The rest of the crew had been sitting around all morning. I begged a few moments to rest, and then once again headed into the Metro. 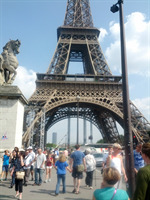 This time we came out at the Arc de Triumph and worked our way down the Champs Elysee. It's a very high-class part of town and shops were everywhere. Isa's eyes lit up and we'd go fifty feet before she pulled us into another clothing store. I was very patient and they all took pity on me by stopping at a cafe after the fourth one. Emma had a vanilla coffee milkshake, I had a cafe au lait, and drank Isa's vanilla coffee milkshake when she didn't want hers. Eventually the girls were satisfied and we headed to the Musee d'Orsey, which was the impressionist museum. I thought it was pretty amazing, from the building - an old train station - to the art - countless pieces that I've seen reproduced all my life. They kicked us out and we invaded the gift shop. I consulted my tourist guide on good places to eat nearby and there was a highly recommended one called Le Bon Excuse (the good excuse). We walked over, only to find the maitre de with a bloody face and police arriving in droves. After a few moments, we realized dinner was unlikely and we went up the street to another corner restaurant which was quite good. We hopped on the Metro to get home, with Emma expressing more confidence in how it all works. We collapsed at our hotel and hung out. My phone had died, but I got some mail indicating that Joanna had made it safely to her brother's house, immediately put to work watching her new baby nephew. As for today, we're off to Varsaille. Let me see if I can put together some video and slowly upload it over the hotel''s incredibly slow Internet connection. It was a somewhat exciting day, but I'm writing this in the courtyard of our lovely hotel. It's reminiscent of a villa from southern France, with stucco roof tiles and everyone eating outside until past ten o clock. Joanna went to a nearby shop and made dinner for everyone - pasta, salad, bread, wine, and plenty of cheese and nutella for all. Kids are getting to bed and the rest of us are huddled around our laptops and e-readers. It's quite nice. This morning Joanna, I, and the kids headed out to the shops near our hotel. It quickly became apparent that patience was low with the younger kids so we split up and I took the kids to feed them and head back to the hotel. Joanna returned with her dress from Fat Face, and we worked our way to the Eurostar train station. It took more effort than expected and we arrived at the gate for final boarding. The train itself was quite nice once we loaded on our luggage and we had a fairly relaxing trip under the ocean. The kids were disappointed that there were no shark attacks or any visible ocean at all. Emma had fun going through the French/English/German train magazine and finding the inappropriate ads. She ended up writing "Inappropriate"and drawing black circles over the relevant bits. We arrived at the Paris train station, unable to find my mom. Joanna went through a complicated process of getting Euros so she could pay money to go to the bathroom, and during this time my mom arrived. We set off again through the Metro and I injured myself once again. The first time was the escalator in the tube, bruising my arm as I tipped over. This time it was breaking my toe nail while hauling massive luggage through the Metro turnstile. 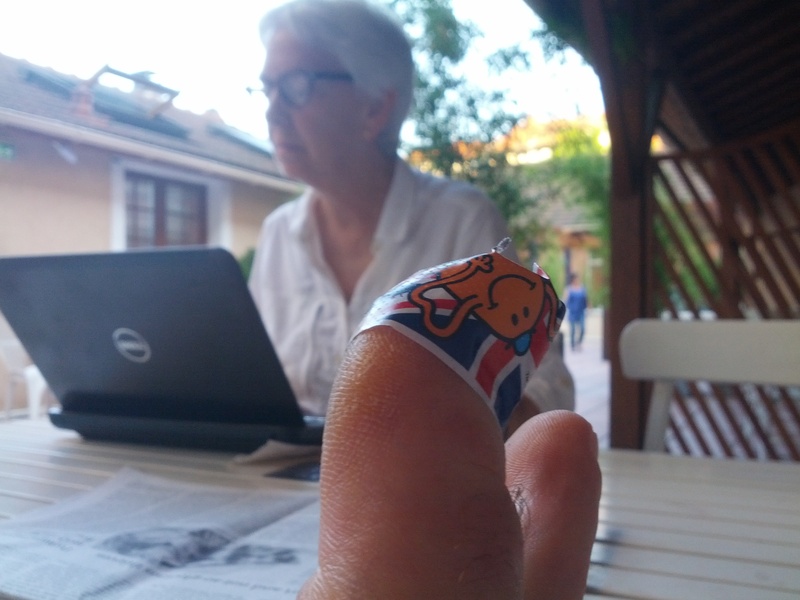 Fortunately Joanna had Mr. Tickle bandages, which I thought was rather sporting. On the plus side, a nice American woman gave me all sorts of tips while staying in Paris, from always saying hello before any transaction to the free cafe at the top of the shopping center where you can see the city all around. After walking uphill near a somewhat hot and dirty city street, the arrival at the hotel was a special occasion. There was air conditioning, an open courtyard, and neat little rooms with small but functional kitchens. We arranged the outdoor tables into a long seating arrangement for dinner, Joanna made a great meal, and we had a wonderful dinner before the night set. Other than an outing for dinner at a Mexican restaurant, we didn't do much last night. We ended up sleeping Emma and I in one bedroom, and Joanna and the little kids in the next. I slept like a log, but got up close to six, a first for me. Apparently I'm returning to a more normal sleep schedule in this time zone. I added a picture on the London Bridge and a panorama of the Tower of London to yesterday's post. I managed some frivolous web surfing while everyone continues to snooze. I think we'll try a little shopping this morning and then head out to Paris after lunch. It was a bit of a rough night, with musical beds and kids waking up repeatedly. Somehow we got enough sleep to function and wandered down to breakfast. I had a bit of eggs and hash browns, but mostly devoured crepes and espresso. I figure we have to prepare our stomachs for Paris tomorrow. 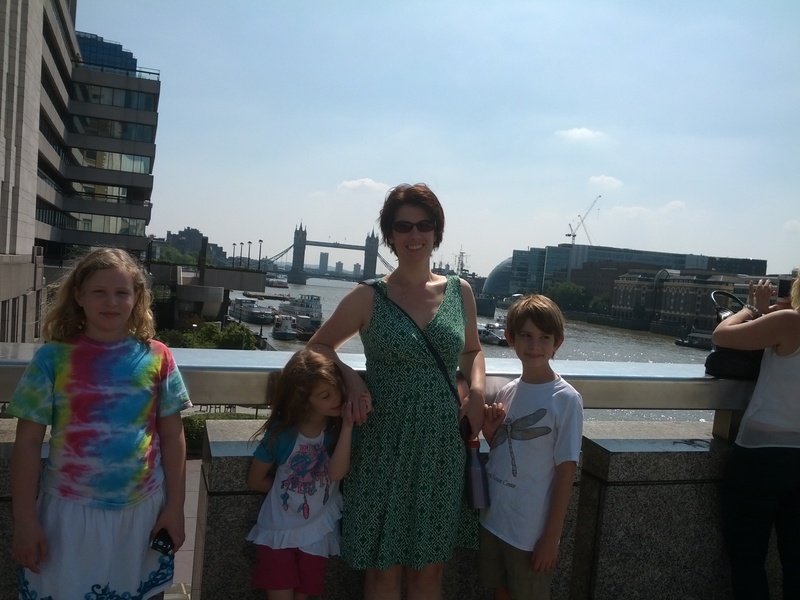 With everyone fresh, we jumped on a bus and watched the sights until we unloaded down by London Bridge. There was a pretty walk along the shore until we made it to the Tower of London. Emma and I braved the queue for tickets while Joanna and the little kids had iced lollies. The latter made Joanna quite cheery and we marched into the Tower and enjoyed the beefeater's tour until breaking off and exploring the various towers. We ate, picked up trinkets at the shop, and headed out once again. We passed by a model posing for a photo shoot in the park, among all the Londoners sunbathing in this uncommonly warm weather. Buckingham Palace was adequately opulent. The kids liked the soldiers in their funny hats (Berry thought they were afros). Everyone was pretty beat, though, so we took the bus back to the hotel. We've been watching Mythbusters with a British narrator, but I think it's time for me to sign off and find somewhere to eat dinner. 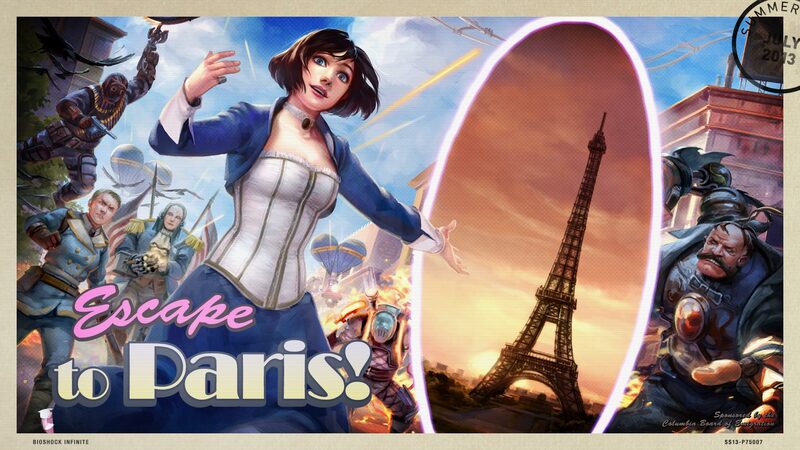 Tomorrow we're off to Paris. It was a pretty good day in London. We slowly roused ourselves and checked out of the airport hotel. We picked up our sim cards, got our tube passes, and worked our way into the heart of the city. We bid farewell to Seraph, Isa, and my mom, then headed to Angel station to find our hotel. We settled in and then headed off to lunch. It turns out there was a little Asian food place called Wagamama with adequate noodles and goodies for all. 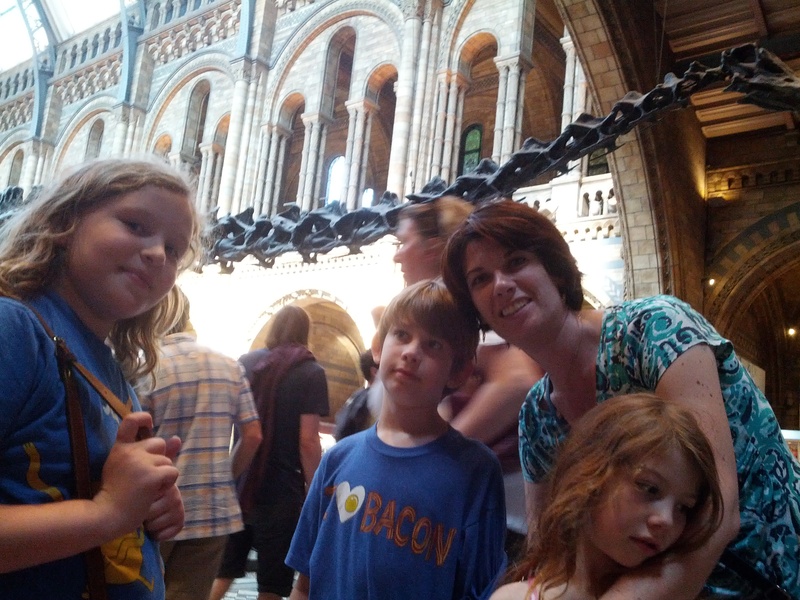 Next was a tube to the Natural History Museum, where tired kids perked up and got excited once we saw the massive building. Inside was the giant dinosaur and they excitedly moved into the dinosaur exhibit. We had a good time exploring the various rooms and ended up in a giant building called the Cocoon where they housed the insect exhibits. That was fairly empty and cool, though we had to leave early as the museum was closing and we had to make a shopping run at the gift shop. We had dinner at a nearby little restaurant where Berry assembled her anatomical model of the human body. We chatted and caught tiny plastic lungs and other organs when they fell to the floor. Eventually Emma put it together, to Berry's great joy. All the kids were pretty wiped out and we put them to bed. Tomorrow I think we'll make our way to the Tower of London and perhaps Buckingham Palace if we can make our way there. Quiet moments at our hotel in Paris. There's time to explore later. We just woke up, a full night's sleep under our belts. I think we're adjusted after a day of jetlag. We basically hung out at the hotel recovering yesterday. Joanna's dad and stepmom came to dinner with us last night. It was an interesting experience, and as I joked with Joanna "it all makes sense now." Isa and Emma spent the day hanging out and chatting. Seraph and I picked up where we left off, as always. Berry and Duncan were pretty wonky yesterday night, but slept really well (and are still sleeping). We've got to figure out what we're doing with our luggage as we get to our next hotel. I think we'll see Buckingham Palace today and wave to the queen. We're at the Jury's Inn, waiting for mom, Seraph, and Isa. Joanna collapsed with a pillow over her head. The kids are watching some crazy English kid show about pirates and veggies. I'm wrestling with Internet connectivity - I got it working on the laptop, but it doesn't appear to be working with anything else. It was quite the journey. We drove to Portland, parked in the blue P2 lot, and jumped on a plane to Texas. The first flight was relatively uneventful, everyone playing on their personal digital devices. We got off, ate a quick meal, and jumped on another plane to London. This one was longer, but everyone managed to get to sleep. Emma had a rough time of it, but was quite happy that she got a few hours of sleep before landing. We stumbled through customs and worked our way via bus to the hotel. Now we're hoping to connect with the rest of the group, though we're currently failing. Time to be responsible . . .
We're all packed and ready to go! We're heading out to Santa Fe in an hour or so to catch the first leg of the trip. I'm actually looking forward to the plan ride so that I can unwind and let it all sink in. I am ready for England. Is England ready for me? Sadie and Seraph, do you remember this traveling poem from our 1990 trip to England? Emma arrived from her Bend trip. We're slowly packing up and getting ready to go, trying not to get too frantic. I figure as long as we have passports, money, and underwear, we'll be okay.